Can Apple's News app balance your political viewpoint? This fall's upgrade to Apple's iPhone and iPad operating system comes with a new app called News. It aims to be the best news-reading app out there — a constantly-updating collection of stories from big and little news sources all around the world. Six weeks after it launched, Apple said 40 million people had tried it out. Dozens of publishers, including CNN, make it easy to read their stories inside the app. Some of them have cheered the launch while others say Apple (AAPL) needs to work out the kinks. 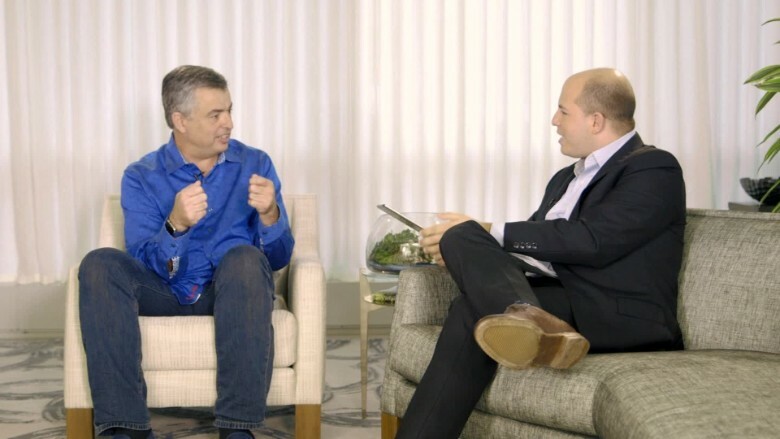 When I spoke with Eddy Cue, Apple's senior vice president for Internet software and services, he portrayed the app almost as a public service designed to deliver more news to more people. Of course, more time spent in the News app means more time spent in Apple's orbit, which is good for the company, too. And Apple sells ads next to some of the news stories. Here are excerpts from our conversation. 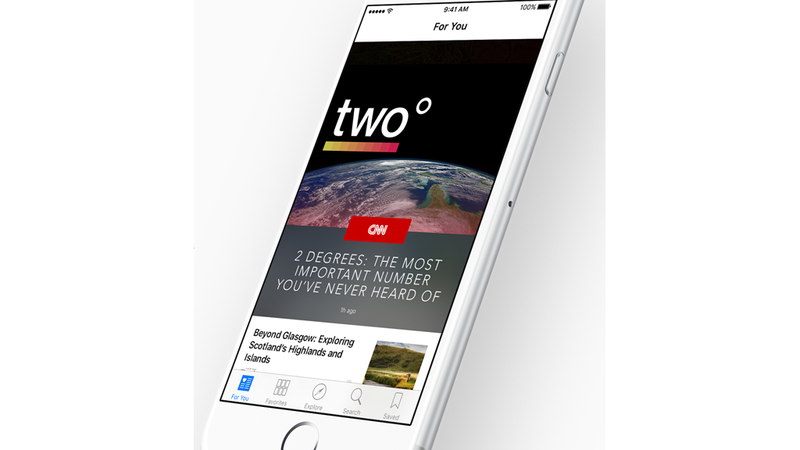 Why create a pre-installed iPhone and iPad app specifically for news? "We've only created the apps that we think everyone uses every day... We really wanted to create a single app that all customers could go to, to read all their news — no matter what they are interested in, no matter what topics, no matter what publications they want to follow — and get that experience that they're used to with our products, where it looks beautiful, it's really easy to read and yet it provides all the content available around the world." How does the app help pay for journalism? "We have two choices for anybody who is providing content or news. One, they control the ads and they keep 100% of the revenue, so we don't get any revenue at all. [Or] they can also come through us and we will sell the ads for them. In those cases, they keep 70%." So how does Apple benefit? "We benefit by creating a great application on our devices. And we think this is a really, really important application for the world." Many journalists have concerns about tech companies like Apple, Snapchat and Facebook gaining more control over the distribution of news to the detriment of the news producers. Presuming you think this anxiety is misplaced, why do you think so? "News organizations today have lots to worry about: Each of them has to worry about building their own apps, the interfaces, the user experience." Particularly for local news outlets that can't afford their own apps, "This gives them an opportunity to focus on what they do really well, which is the journalism part, and let us handle the technology piece of building the apps and distributing them." Do you see this app as a way for upstart news organizations or tiny publishers in small towns to distribute their stories? "I absolutely believe in that. It was one of our main goals when we were building Apple News. We thought of things from, you know, even church newsletters to a stamp club... A lot of those organizations today still print and mail, which is even more expensive." Right now the app is available in the United States but not in other countries (although there are some workarounds). There have been reports about the app being blocked in China. What is its status there? "We're working on a version for China that hopefully we will be able to introduce soon. We've got a great Chinese customer base and we want to deliver as great of an experience in China as we do here in the U.S."
Are you facing censorship hurdles in China, especially considering the challenges that many news organizations have run into? "No, we're not. We know how to work in China. We've got app stores. We have got our retail stores there. We launched Apple Music in China. We have a great working relationship in China... We follow the laws of the countries that we are in and we'll work with the local news organizations and the international news organizations that are available in China. We have been very successful at that." Will Apple ever employ journalists directly? "It's not in our plans at all. Again, we try to focus on what we do really well. We build technologies and we know how to do that really well. We think there are great journalists around the world and we want to empower those journalists to get their content right to the customer." Who's your target customer for Apple News? "It's everyone. Whether it's my 13 year old who is just getting educated on certain news topics but is more interested in entertainment news or music news — but with Apple News, she is discovering other things too. Or my dad, who is interested in politics and interested in what's happening in Europe. Apple News is absolutely for everyone."